From the Girls, Laura Danica and Rebecca over at Hooked on beauty : laurecca.blogspot.co.uk They all run the blog together which i think is a nice idea :). Thank you for the nomination girls ! 1.You must link back to the person that nominated you. 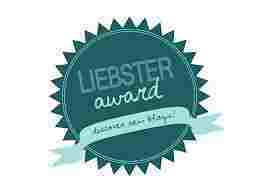 2.You must answer the 11 Liebster questions given to you by the nominee before you. 3.You must pick 11 bloggers to be nominated for the award with under 200 followers. 4.You must come up with 11 questions for your nominees to answer. 5.You must go to their blogs and notify your nominees. 1.If i gave you £1000 would you rather spend it on clothes or makeup? 100% Clothes ! as much as i love beauty my first love will always be fashion, However i may save this £1000 until i got to NewYork in December for shopping then ! 2.Who is your favourite music artist? 3.What is your favourite beauty brand? 4.What was the last film you watched? 5.Have you got any beauty secrets if so what is it? 6. Describe you style in three words! There are no words to describe my style .. *Cringe* This is hard really as it truly depends on the occasion! I like quiet casual, comfy and tidy during a day time. But for a night out defiantly Glam, big and bold ! I love winter ! i love get warm and cosey and having nights in snuggled and drinking hot drinks ! I do hate being cold though. My favourite thing to do is Skiing so you can only do that in winter really ! 8. What are your three beauty essentials? A good Facial wash/ cleanser / creme i'm currently using Clinique. 9. Favourite song at the moment? I loveee Robin Thicke Blurred lines .. its getting a bit old now but it just makes me want to groove ! I think it was Band of skulls in December, My boyfriend surprised me with tickets for my birthday. Wow can not believe it was that long ago ! 11. If you could live anywhere where would you live? 1.What is the inspiration behind your blog name? 2.Where is your favourite place to shop and why? 3.Who is your favourite designer? 4.What is your phone wallpaper and why? 5.Where was your last holiday too? 6.What was your last Splurge ? 7.What do you enjoy most about blogging? 8.What inspires you to write blog posts? 9.What is your dream job? 10.What is your can not live with out item? 11.What will make you want to follow another person blog? Make sure you comment or Tweet me when you have answered your questions!